Mark Webber is sitting across from me in the driver's seat of a new Porsche 911 GT3 RS, trademark grin wide on his semi-bearded face. "Good, right?" Webber had been at the Nurburgring the week before when Lars Kern set a new record at the Nordschleife for naturally-aspirated production cars, breaking the notorious seven minute mark and coming in at 6:56.4. So, yeah, it's good. I had just got a full-on taste of the car for myself at the Nurburgring Grand Prix course, circling the 3.1-mile circuit a dozen times. My blood was already up, and then I asked F1 and Le Mans champ Webber to take me around in a "Lizard green" Weissach model. Two incredibly swift laps — in a light rain — and then we pull back into the pits. Heat radiates off the Michelin Cup 2 tires and the titanium rear pipes glow despite the 45 degree temps and light rain in the Eiffel mountains. "The car just gives you such confidence," Webber is saying, "whether you're a weekend warrior or one of us." By one of us, he means winning F1 and Le Mans drivers. By weekend warrior, he means the likes of me. And he's right: Porsche's latest version of its most focused, road-legal track machine spreads its confidence across a fairly wide radius of drivers, as long as you're competent enough to know which inputs you want to give to get back an expected result. This is no video-game machine designed to even out mistakes — or talent. While we may hear this all the time, the company isn't engaging in marketing speak when they say that "no Porsche car is closer to motorsports. " Porsche claims that 85 percent of buyers of GT models regularly track the their cars. So it makes sense that the GT3 RS was developed by the Weissach-based GT team in conjunction with the GT3 R racecar. And seeing that the naturally breathing 4.0-liter flat six makes 20 more horses than the racecar (for a total of 520 hp) and revs up to 9,000 rpm, it could conceivably keep up with racetrack brother on racing slicks. The 911 has always been an evolutionary machine and the GT models are no different. 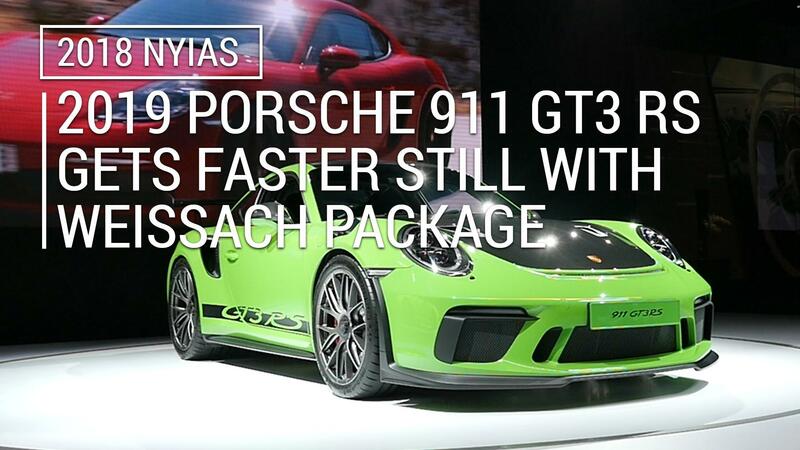 The GT3 RS got its start in the 996 generation, which the U.S. didn't get. Four cars followed, including the 997 II RS 4.0 and 2015 991-based version. I've driven all of them except the original, and I did manage to tick that box this trip, too. 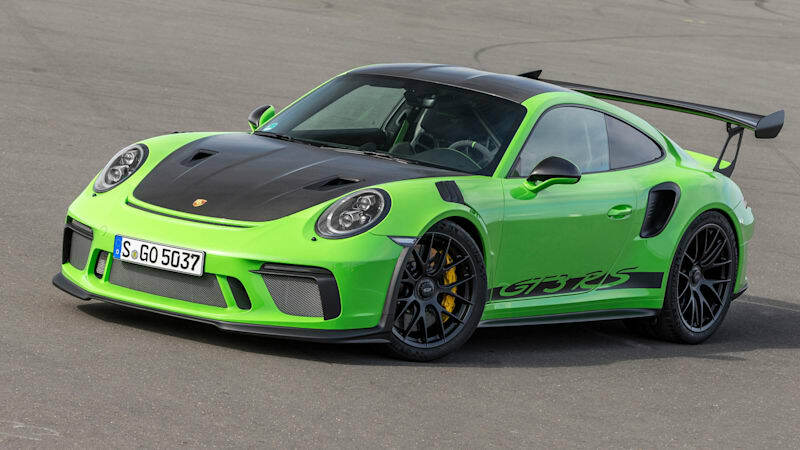 While the sixth car, the 2019, is directly based on last year's GT3, it's more instructive to compare it to the 2016 GT3 RS model. That car felt pretty damn unbeatable on the track. While the advances on the previous generation are discernible, they are not revolutionary. Worth noting are overall tweaks to the already brilliant suspension, with higher spring rates and metal ball joints on all bearings on the chassis. The previous model had rubber joints up front. These small changes are alchemy, but as proved by the Ring record, they yield results. Outwardly, the 2019 gets an entirely new front end, NACA ducks on the hood for better brake cooling and front downforce. It's also a tad more spry, with 20 more horses and 7 more foot-pounds of torque, now reaching 60 mph in 3 seconds. That's all of 0.1 seconds quicker. Though I knew neither the track nor the car, I was moving fast and hard by my second set of laps, following the line of a pro driver in a GT2 RS. The Porsche kept presenting places where it could be pushed harder and deeper into the corners, damp track be damned. Not once did it get out of line or give me any concern that the rear end would try to lead the way — that classic affliction of older 911s. The latest generation of Michelin Cup 2s give incredible grip even in the cooler weather. But what most surprised me was the traction of the front rubber. The weight on the 911 sits on the rear, so getting the weight to shift forward is traditionally a bit of a trick; one that might even take a stab of brake or a sudden lift off the accelerator pedal. (Never try that latter trick on an older 911 at the limit in a corner... trust me.) Those tricks are unnecessary. Turn-in is as pure and intuitive as any sportscar could hope to give, and the weight shifts fluidly. If you're looking for a stick and a GT3, look to the GT3 Touring. The RS comes only with a 7-speed PDK transmission because it's more competitive on-track. On my first set of laps I left the PDK in automatic; then used paddles for the second set. I was probably slower shifting myself, but I enjoyed it more. Even in the wet, the third-gen carbon ceramic brakes were sure and focused, with great pedal feel. Sending the car around feels totally intuitive, with speed building in a gradual rather than blinding way. The supple suspension allows you to make adjustments even at mid corner, and feedback in the steering is good. The front end takes a bite and don't want to wash out if you get on the gas too early in a corner. The traction from the rears is relentless. Meanwhile the sound of the flat six is wonderful, blossoming into a greater cacophony as speed and revs build. You run out of full grunt before hitting 9,000 rpm, but it's worth getting there just for the noise. All that said, there is nothing that shatters an amateur's racecar-driver fantasies more quickly than taking a hot lap with someone like Webber. And it is totally worth it. With the rain speckling the windshield, Webber moved out onto the track in that way that only comes with ultimate authority. He brakes early and seems to turn in even earlier. But then he rides the balance of throttle and chassis through long turns in a soft dance, seamlessly transitioning to flat out the moment the corner opens. Nothing jerky, and no harsh transitions, but you feel G-forces pushing upon your body at every moment. Even his paddle-shifts flow into each other in a way that I barely notice them, and they never unsettle the car. These are the ministrations of a master. Not a bit of showing off, either. Afterward, in the pits, we talk. "The platform is just so stable that you can come hard under brakes. You're already settled so you can set up the corner exactly like you want to. You don't have to readjust your corner entry." That grin comes on again. "Hey, I'm no expert in sports-car racing. I've got such muscle memory from my years of F1 here, and incredibly, I'm just using the same lines. And In a road car! Mate, that's incredible."